Politeness sometimes is sharper than a knife and more irritating than a fight. Cordial language is undoubtedly overrated and what you say with a placid smile can slap faces like the strongest hand. In particular, if it’s your hideous boss demanding something with that false and condescending smile on his face, his “that would be great” can drive you nuts! With this “Office Space meme” you can appropriate this non confrontational pesky attitude to express your sarcastic kind requests. Exactly like Bill Lumbergh, the character of the TV comedy Office Space, used to do with his employees, you will reach peaks of annoyance with the perfect mix of politeness and contempt. 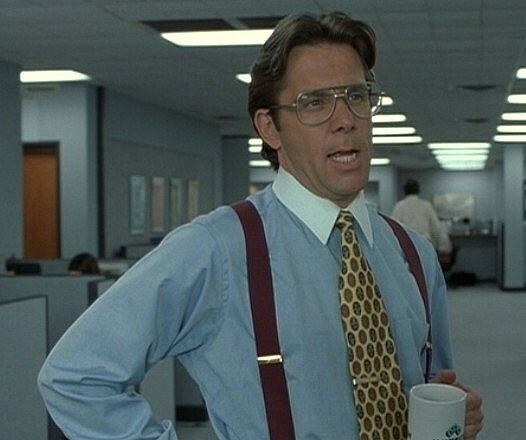 Get ready to say anything that goes through your mind and yet to feel good about it: in this “Office Space meme”, the attitude, as fake as it can be, is all that matters… Create your Office Space Meme If you want to create a “Office Space meme” here on Meme Generator, that would be great. Bill Lumbergh would probably ask you to create it on weekends but you can actually do it in few seconds whenever you want. Generating your own meme is free and easy and your creations are royalty free. Just click on the button “create a meme” and type the caption in. Write a sentence at the top and one at the bottom of the image. To reach the best effect, the bottom caption should be “That would be great”: exactly what Bill Lumbergh would say! Yeah, if everybody could just please stop sharing posts about the company they work for..